This marker and monument mark the location of the intersection of 4 one square mile sections of the original subdivision of the Irvine Ranch. The land was originally granted to José Sepúlveda in 1837 and became known as Rancho San Joaquin. As was typical of the era, a hand drawn map was created citing physical and geographic markers as edges and corners. Some of these early markers included Newport Bay and Laguna Canyon. After California statehood, James Irvine and two partners purchased the land grant in 1864. 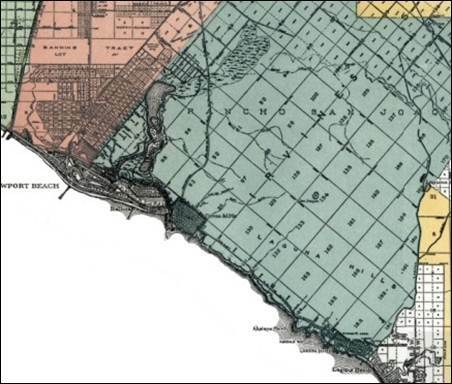 The land was mapped and recorded as “Irvine’s Subdivision”. Fast forward to 1959 when the Irvine Company, at this point still owned by the Irvine family, began negotiations with the University of California to locate a new university on the urban fringe of Orange County. The agreement was finalized for the first 1,000 acres in 1960 with another approximately 500 acres to follow. This forward looking agreement envisioned and planned for housing for students and employees. The newly created University of California, Irvine welcomed its first student in September 1965. By the 1980’s, UC Irvine leaders recognized the importance of providing a more affordable housing option for faculty and staff and began work on the University Hills housing program. In October 1983, the Irvine Campus Housing Authority was created to develop, construct, maintain, and oversee the future community and housing program for the University. 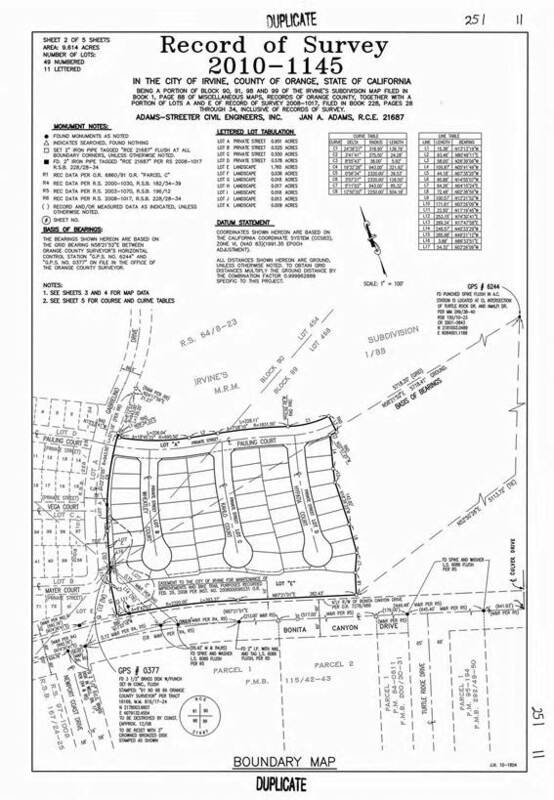 The land was mapped once again in 2010 with the Record of Survey 2010-1145 to create the individual lots for University Hills Area 10-1 and the 950 Series Homes. 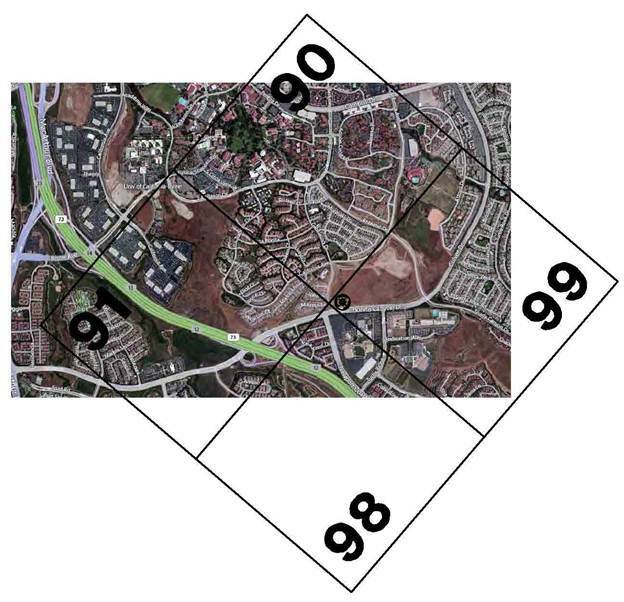 At the southwest portion of this new neighborhood, 4 of the Irvine’s Subdivision sections 90, 91, 98, and 99 meet. The County of Orange requires certain mapped features to be permanently memorialized, including Section corners. 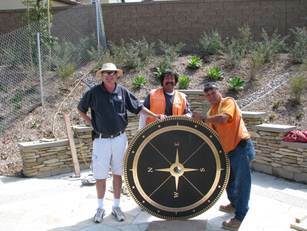 Earlier in 2008 during the construction of University Hills Area 9-2 and the 920 Series Homes, Steve Jimenez, the survey chief for the civil engineering firm mentioned the future Section corner and the need for a marker to Victor Van Zandt of ICHA…and he gave him a book of photographs of artistic survey markers throughout the United States. The images in this book became the germ of an idea to create something of interest at this location. 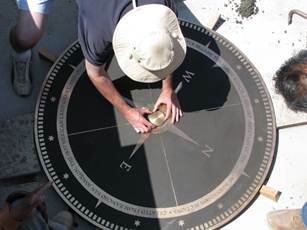 With the concurrence of the ICHA leadership, a team was assembled to design and build a permanent marker monument along the lines of the informational signs found in national parks. 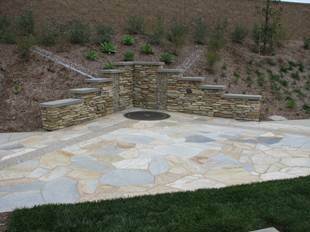 The team included Ridge Landscape Architects, JB3D, Adams Streeter Civil Engineers, PBC, and California Pacific Homes. The University Hills Section Marker was completed in May of 2012. · Every home in University Hills is located within one of these 4 Sections. 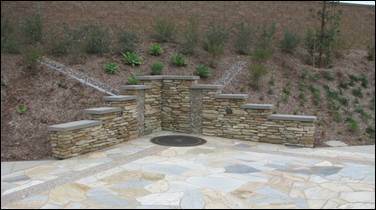 · The Section Marker is 4’ in diameter and is cast in bronze, a durable metal for outdoor applications. 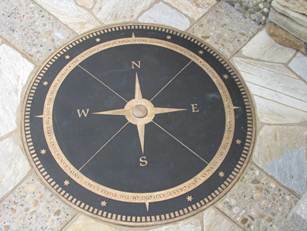 · A 3” bronze marker in the center of the larger Section Marker is required by the County of Orange. 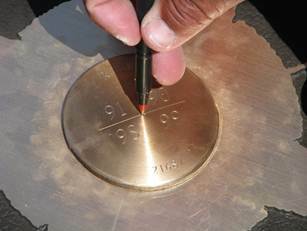 Its detail is shown on the Record of Survey and is actually a separate bronze marker placed in a hole in the center of the 4’ Section Marker. It was installed to an accuracy of less than the width of the point on a ball point pen. · The Section lines appear to be 45 degrees off of cardinal direction. However, they are actually slightly counter clockwise of 45 degrees. · The larger Section Marker was completely designed on a computer. A computer controlled lathe created a reverse of the Section Marker in a special plastic, which became the cast for the bronzer to use. 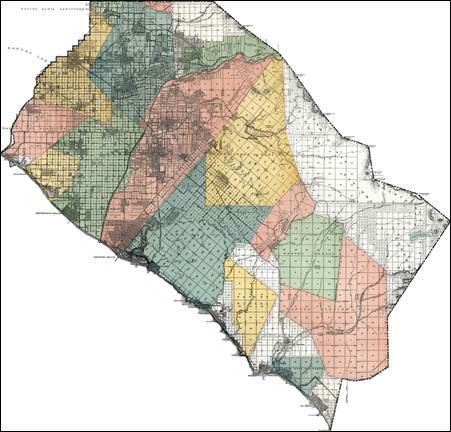 A 1955 map of Orange County depicting Mexican Land Grant Ranchos in color and subdivision lines in black. Here is a zoom-in view of the previous map. Can you identify the intersection of the Section corners? The University Hills Section Marker. The 4-foot Marker with the 3” Disc. Tom Ralph (CPH), Steve Jimenez (ASCE), PBC foreman. Tom Ralph makes minute adjustments. Accurate to the width of the point on a pen. Record of Survey 2010-1145. Note the location of the Section Marker, Section numbers, and locations of other important survey markers. An aerial image of UC Irvine and University Hills from 2009 with the four Sections overlaid in black. Each square section depicts one square mile on the aerial.